Three weeks later we are back in Jacksonville safe and sound. 3000 plus miles on the road, we have had another great adventure with results that could not be any better. We simply won all the races we entered! 16 out of 16…… Ok, not much competition in some of the races, but I rode each one like there was. I was able sometimes to finish some of the races first overall, starting from the second wave. 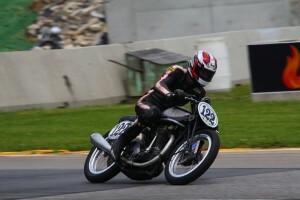 Rob McKeever’s Norton Manx’s ran perfectly well during both meets. The tachometer on the Replica went crazy and was showing 9000 rpm down the front stretch at Grattan. First gear started acting up on the oldboy 1937 Manx but nothing my right foot could not deal with. Some safety wiring, air pressures, gas and oil and off we went. Some racers would appear on my grid that I had never seen before, so I would just take off hoping never to see them again. The Grattan track was super slippery on Saturday, an oil spill and new slick black patches, making you back tire slip out on any acceleration, had you riding on eggs. Sunday, the track had regained its grip miraculously. Bob McKeever made it to Rd. America and was cruising around on his new 4 wheel cart, with his champagne basket full of goodies. 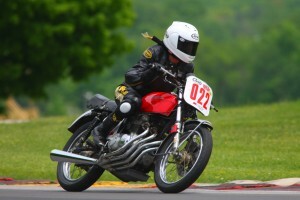 Cindy Hill was trying out her Honda Cb400f for the first time, and finished her four races and weekends always in the top five. Very consistent, knocking 4 or 5 seconds off her lap times each day. She got all the attention. Lynn and Art Farley put us up between the two races and we had the best of times with them and their friends Gary and Ralph, Harley Pros. When Art wasn’t around though, I had them working on the Nortons, just polishing. A big thanks to our sponsors and friends and all the paddock who as usual were all smiles and fun.